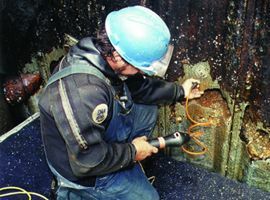 The success of any repair project on the waterfront begins with a proper condition survey. The quality of the initial survey depends greatly on the experience of the engineer's inspection team. Hudson Marine has on its full time staff Professional Engineer Divers with extensive experience in the marine field. Trained at accredited commercial diving schools, Hudson Marine's inspectors can take the condition survey through all the stages of planning, recording, and documentation. This results in a high quality report, on which any owner or designer can depend.